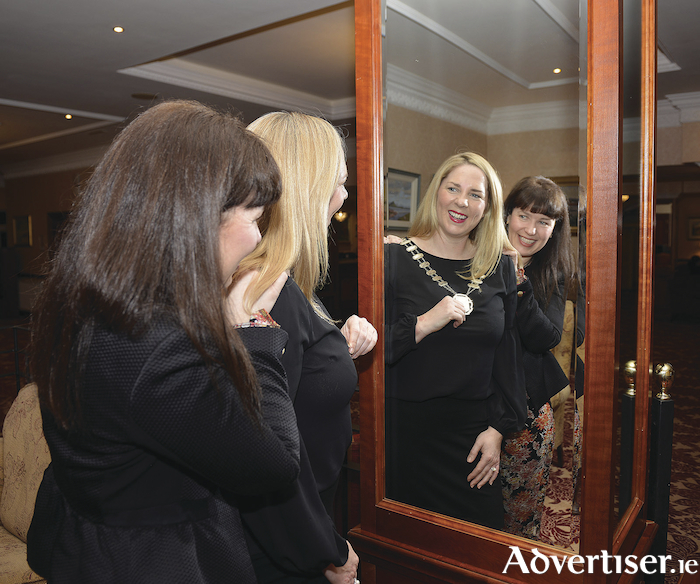 Joanne Murphy of Tri Talking Sport was officially appointed President of the Business and Professional Women’s Club Galway at their AGM in the Ardilaun Hotel on Monday, succeeding Valerie Murphy who held a two-year term of office at the helm of BPW Galway. A well-known figure in Galway from her numerous years of professional fundraising for Enable Ireland and the Irish Cancer Society, Joanne Murphy has forged a successful career and business as an Event MC, presenter and sports announcer in recent years. Working with many international events at home and abroad she is widely recognised as the ‘Irish Voice of IRONMAN’ and is regularly heard in the National Indoor Arena as host of the Gymnastics Ireland events and competitions. Complementing her presenting career, she also provides sports event management and marketing support to a number of events, working with Lough Cutra Castle Triathlon as well as RunIreland.com, sister company to Proactive Design and Marketing, she is also an ambassador for Windsor Galway Renault. A keen triathlete and cyclist Joanne holds two Irish endurance cycling records with her fellow Galway Triathlon Club members; The Galway Baybes for the Race Around Ireland (2017 ) and the Donegal Ultra 555k (2018 ). She is also a Global Ambassador for the IRONMAN Foundation’s Women for Tri Initiative, encouraging women to take up the sport of triathlon regardless of age ability or aspiration. “As incoming President I am inspired and influenced by the many great Presidents who have held this role before me,” she told the Advertiser last evening. Joining Joanne on the Executive Committee for 2019 are: Annette Walsh, Vice President, Attracta Real, Treasurer, Sheelagh Mulcair, Secretary as well as Johanna Downes, Moyra Mc Mahon, Catherine Piggot and former President Valerie Murphy. BPW Galway has an exciting line up of events for 2019 highlights include the Annual Candle Lighting Supper in the Harbour Hotel, the Summer Lunch in the Ardilaun Hotel, the Public Speaking Competition and the big highlight of this year the BPW European Conference taking place at NUIG from 24th– 26th May.